When someone mentions the many risks a business faces, what may first spring to mind are strategic risks, such as choosing what products to develop or markets to target. Or maybe the risk to a company’s reputation if something goes wrong. There are also financial risks associated with debt, cash flow and currency fluctuations. But what about the commodity your facility depends on every second of every day? For many organizations, electricity is mission critical. A power failure or a problem related to poor power quality can mean an expensive disruption to operations. Power-related losses to the European economy have been estimated to exceed €150 billion annually, while in the US such losses could be as high as $188 billion. For operations like data centers, hospitals, airports and manufacturing facilities, a loss of power is more than a nuisance, it represents a significant financial risk and can even be responsible for loss of life. With so many risks related to a facility’s electricity supply, it’s surprising that so many organizations aren’t adequately managing it. As with most commodities, the value of electricity is a balance between cost, reliability, and quality. With the right information, insight, and decision making, it’s possible to maintain a healthy, reliable electrical distribution system that delivers high quality power to the assets that are connected to it, while keeping your electricity costs to a minimum. In this post, I’ll help you understand the types of risks your facility team should be watching out for. In my next post, I’ll talk about how an Energy and Power Management System (EPMS) can effectively help you minimize these risks, keeping your operations running efficiently and your energy costs under control. First, let’s take a look at the challenges of managing the cost of electricity. How much you pay for electricity depends on the specific rules of the tariff structure applied to your facility. Some rate schedules can be very complex, making it very difficult to know what you can do to reduce the bill. Most electrical utility tariff structures charge not only for the amount of electricity consumed, but also how and when you used the electricity. Also, many electrical utilities have “load curtailment” programs for commercial and industrial customers, whereby significant discounts are offered if you can quickly reduce electricity usage below a specified level for a given period of time. Purchasing electricity can be even more dramatic. In some places, power is purchased on the open market in real-time and prices can change many times a day. In these dynamic energy purchasing environments, many facilities have their own generation capabilities and can produce power locally when electricity prices are high, thus reducing their demand from the grid. Conversely, with an EPMS, they can also make more use of grid-produced electricity when its prices are low. Regardless of how complex your situation is, you should always understand the variables that contribute to your electricity bill and know how your operations affect how much you spend on energy. If you don’t, the consequences could be costly! 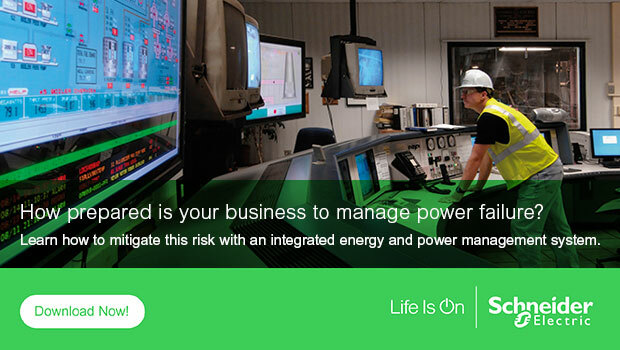 When we talk about power reliability, ultimately, we’re talking about business continuity. Is the power there when you need it? For most businesses, this means 24 hours-a-day. Your power utility may be able to deliver reliable power, but even at 99.9% availability, that equates to up to 52 minutes of unplanned downtime. Even a few seconds of power interruption is totally unacceptable for operations like hospitals and data centers. If you are operating a power-critical facility, then you likely have an onsite backup power system, that will help you ride through the occasional utility outage. But it won’t guard against electrical problems and disruptions that originate from within your facility. And that’s where 80 percent of disturbances are typically generated. The failure in a facility’s power distribution system could be due to a number of different conditions: overloaded or unbalanced circuits, undersized conductors, faulty grounding or connections, or aging equipment. Of all the risks associated with your electrical supply, power quality problems are often the most overlooked and misunderstood. Power quality issues can take many forms, and most remain invisible and unnoticed until they cause something to fail. The first thing to understand about power quality problems is that they may originate on the electrical grid and be introduced to your facility, or they may originate inside your facility. Other than power outages, the most common and impactful type of power quality event that comes from the electrical grid are called voltage sags. These are sudden drops in voltage that occur very quickly, but power is not completely lost. Consider when the weather is bad and the lights in your house blink or dim quickly, this is an example of a voltage sag. While this may not be an issue for you or the lights in your house, large voltage sags in a commercial or industrial facility can cause a variety of problems such as equipment resets, machine malfunction and nuisance breaker tripping. Other common grid-related power quality issues are voltage transients – large sudden spikes in voltage that occur very quickly. Lightning strikes are one cause of voltage transients. You cannot prevent voltage transients from occurring on the grid, but you can easily dissipate or block them from entering your facilities electrical system using surge protection devices (SPDs). Other utility-introduced problems include ground faults (often caused by objects falling on electrical lines) and voltage regulation issues (when voltage levels are chronically higher or lower than normal or expected). All of the issues that occur outside of your facility are the responsibility of the utility. To minimize these issues, your best option is to have a good working relationship with your electric utility and have your own power quality metering on your incoming services, so you have the information you need to communicate and negotiate with them. Even though some power quality problems are introduced to your facility from the grid, most power quality issues originate from inside your facility. Voltage sags, transients, ground faults and voltage regulation issues can also happen within your own electrical distribution system. Unlike problems caused by the utility, these issues are entirely yours to manage, so it’s important to understand what power quality issues exist in your electrical distribution system and assess your risk exposure. Have you ever had unplanned downtime due to electrical problems? Have circuit breakers tripped and you never determined why it happened? Has equipment ever misbehaved, reset or malfunctioned and you were not sure of the cause? Then you may have power quality issues. Also consider this: equipment and machines are becoming smaller, more efficient and computerized, which means they draw less circuit, which means they use less energy. This is all good right? Well not quite. This reduction in energy consumption comes with side effects. Modern, microprocessor-controlled equipment tends to cause significant voltage distortion resulting in high levels of current harmonics. To compound the problem, many types of modern equipment are also sensitive to voltage distortion and harmonics. Voltage distortion can cause equipment malfunction while harmonics contribute to overheating effects which lead to damage and premature failure. Another reason why you should be concerned about excessive current harmonics in your electrical distribution system is because they resonate into the neutral circuit which causes overheating in the conductor and leads to power failure or worse a fire. What does your power quality risk exposure look like? To minimize the impact that poor power quality can have on your business, you need to have the right kind of analysis system in place. Electricity is unique. And power quality events can occur in the blink of an eye. Only a specialized system designed for monitoring the electrical distribution network equipment will be able to capture high speed electrical events and provide the resulting information in a simple and meaningful way. And only a full understanding of your power quality will enable next steps. This could be as simple as replacing or servicing a piece of equipment. Or it could require installing mitigation equipment, such as harmonic filtering or surge suppression. Addressing these issues not only improves the quality of your electrical supply, it improves the overall reliability of your power infrastructure, building and manufacturing systems, and business operations. In my next post, we’ll explore Energy and Power Management Systems (EPMS) and talk about how great an investment it is when you consider all of its benefits … especially those which minimize your business risk. To learn more about this subject, refer to our white paper ‘Mitigating risk using power management systems’. Also make sure to discover Schneider Electric EcoStruxure™ Power Monitoring Expert software, one of the foundations of EcoStruxure Power.